My 7-year-old daughter chose this picture today - she liked it better than all my arty shots of weathered barn wood, twisted split-rail fences, or even a golden sunset. Since I've already posted cows, turkeys, vultures and our cat, it fits right in. Maybe soon I'll get a picture of some of our other local wildilfe, like black bears or bobcats. That is an amazing close up of a wild rabbit! I can see why your daughter chose it - gorgeous! Well done. Yes, I am in agreement with your daughter too. 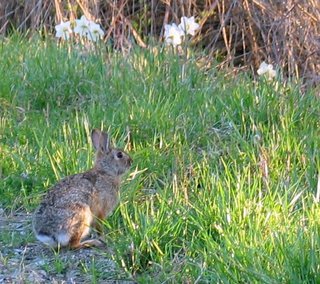 We have a lot of rabbits here, but it is very hard to see an adult one close enough, or for it to stand still, in daylight. Nice photo! Looks nice with the grass and the daffodils in the background.